The US Environmental Protection Agency reports that in 1960 the United States produced some 88 million tons of municipal waste. In 2010 that number climbed to just under 250 million tons—and it may have been higher had a recession not slowed consumption. This jump reflects an almost 184 percent increase in what Americans throw out even though our population increased by only 60 percent. This disparate increase has much to do with what we buy, the quantities thereof, its expected use-life, how it is packaged, and how the packaging itself is packaged, wrapped, surrounded with polystyrene, cardboard, and shrink-wrap. Even simple items like lettuce and chewing gum now come in plastic containers that we use ever so briefly and then throw away. While recycling has trimmed the tonnage being trucked to landfills, America is still a nation that consumes and wastes much more than it ever has. The question is: Why? 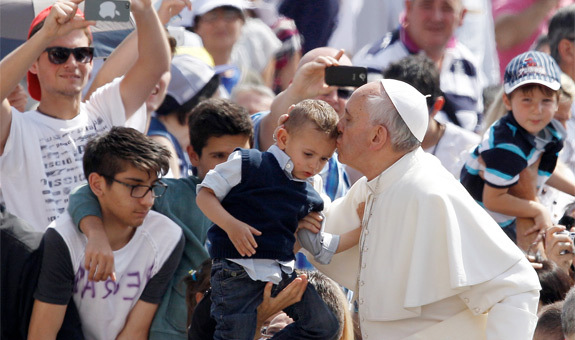 Pope Francis provided some answers in his first major statement on ecology—natural and human. His sweeping eco-comments at Wednesday’s General Audience offer us much to consider. But one theme in particular dominated his words—a theme that follows quite naturally from his predecessor, who he quoted throughout his audience. Western cultures—and those tempted to follow the ways of the West—have come to expect that one can and deserves to attain and consume whatever (and whomever) one wants. Advertisements not only insist that you can have it your way and have as much as you want, but that you deserve to have whatever it is that’s being sold—even if you have lived all these years quite well without it. The makers of such ads understand the fractures in the human soul. They intuitively know that the effects of original sin can be used as a foothold for profit. They create characters and settings that excite our passions. They use language that tugs at our insecurities and at the faint awareness of our incompleteness—a lack of love that all humans crave to fill. In all, the vocation of advertising has become a means to convince us that fulfillment comes only from the attainment of earthly goods. Read the entire post on the “Catholic Ecology” site. One thing I appreciate about Patenaude’s writings on ecology is that he grounds it in a deeply orthodox and theologically informed perspective. In addition, he is not given to overstatements and sweeping declarations that often mark (or marr) the writings of secular environmentalists. Sadly, many good Catholics, for a variety of reasons, flinch or otherwise recoil in horror at the mention of “ecology” or “the environment.” It shouldn’t be that way. Yes, there is a lot to debate and there is certainly a fair amount of both disinformation and confusion when it comes to matters related to the environment. All the more reason for serious, orthodox Catholics to study it, read about it, reflect on it, and pay heed to what recent popes have said about it.